What do I need for my baby's crib? One of the very best parts of my job is being a tiny part of a new baby story, and working with momma's-to-be all day (and a few dads too!). I've been doing this for awhile now and something interesting I have noticed along the way is this: first time mom's are always apologizing that they don't know what they're doing, or don't know how many sheets they need, or even what a minky blanket is. Why would you know these things? Sure, some of us grew up with younger siblings or relatives around, but not everyone. I'm pretty sure our son was the first baby my husband ever held, and definitely the first diaper changed (or was that our daughter three years later? LOL and totally kidding, he's Super Daddy). Sheets: Generally speaking cribs only feature a fitted crib sheet. I will say, a lot of my international clients like flat sheets, but in the US that is not very common. You want to look for something that can be washed A LOT, and features elastic all the way around to prevent the sheet from coming off while baby is sleeping. 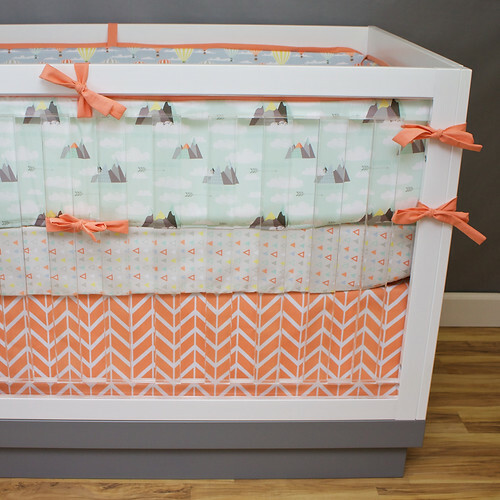 Skirt: The crib skirt goes under the mattress, like a bed skirt would. They come in a lot of different styles. The more modern/boyish will be flat panels (like you see in my shop), other variations will be slightly gathered or even a full three tiered ruffle skirt. Some feature inserts peeking through, or box pleats. They are often sold with only three sides as most cribs are against a wall and don't need a skirt in the back. You may want to check that if your crib will be in the center of the room. Do I need a crib skirt? Skirts are generally for looks, so people aren't able to view underneath the mattress, which is just unsightly. The skirt never touches the baby, and really just hangs there. Some of the more modern cribs will look fine without a skirt if you are going for a minimalist look. Tip: ﻿Your crib will have several different levels for the mattress platform. The skirt will generally be made to fit the highest mattress level. As you drop the mattress down, you can easily tuck the top of the skirt under the mattress to adjust the length above the floor. 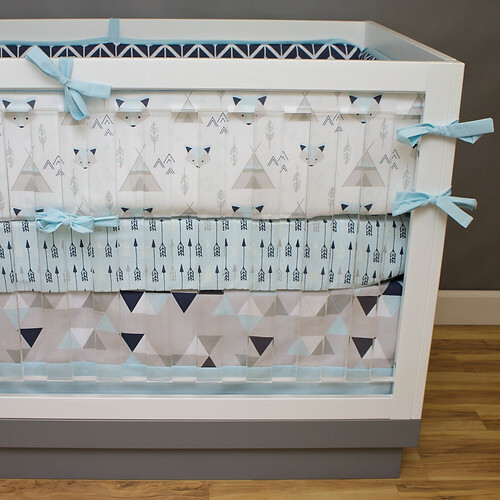 Here are some looks from our shop, the adventure crib bedding has a flat panel skirt with not trim, the fox and teepee baby boy crib bedding has a flat panel skirt with solid blue trim, and the mermaid crib bedding set has a three tiered ruffle skirt. Bumpers: Disclaimer: I have no interest in starting the great bumper debate here, I am simply giving information. I have a lot of clients who don't use bumpers, some that use bumpers when baby is older (and bonking his head a lot) and some that use bumpers from newborn on. That is a personal choice, that you should feel 100% comfortable with. Crib bumpers go above the mattress, and around the full inside of the crib. 'Pro-Bumper-ers' will tell you the main purpose is to stop baby from smashing against the wooden crib and stop limbs from being stuck between the slats. They come in many styles, ranging from very thin/rigid to 'pillow' bumpers. I am not comfortable selling the pillow bumpers, so we offer the thin/rigid style that stands on its' own. Besides the fabric on both sides of the bumpers, most will offer other options like piping (purely for looks) and will need some sort of tie to affix the bumpers to your crib. Don't settle for ribbon ties! They will fall apart quickly, be sure to look for fabric ties. I would also suggest checking the laundry instructions on these. You need something that can be thrown in the wash whole, or with zippers to remove the slip covers for washing. Like I mentioned above, a lot of clients will get the bumpers with the crib set and use them when baby is older and more active, and when they feel comfortable using them. Both of my kids reached a point where they literally couldn't sleep without me putting bumpers in, because they kept bonking heads and getting legs stuck, but not all babies are like that. It's a personal choice, you decide what's best for you and your baby. Rail Guards are a great alternative if you don't feel comfortable using bumpers. 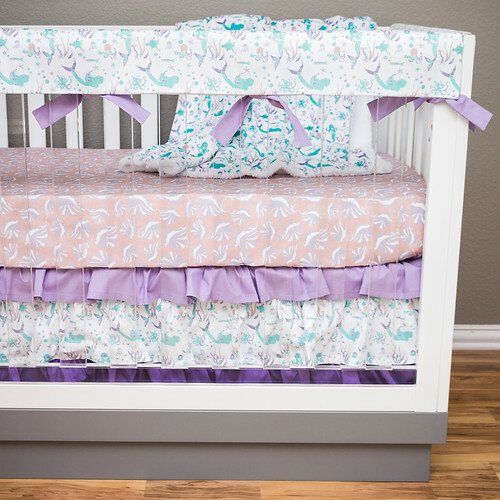 Tip: Make sure you are buying bumpers with ties placed appropriately for your specific crib. Ties are placed for a standard slatted crib. If you have a solid back/sides, or any larger than normal slats or rails, you may need customized ties. You can see here, crib #1 is pretty standard. If your crib features any other slat layout you should check tie placement to be sure you will be able to attach your bumper! Rail Guards: Rail guards wrap over the top of the crib rails to protect your baby and your crib. It may sound crazy now, but believe me, babies chew on those top rails. I actually had to get a second crib for my daughter because my sons' crib looked like a beaver got at it (which is actually when I started making rail guards)! They generally come with a light padding for a little protection when junior starts jumping around in there. You definitely want to make sure it is washable. Tip: Make sure you know what you are buying. Some rail guards are sold with only one guard for the front of the crib, while others are sold in sets of three (one for front and one for each side). In my opinion, if baby is trying to chomp the front rail, baby will definitely move to the side rails if not covered! Most sets do not feature the back side as it is usually against a wall and a lot harder for baby to get at. At Modified Tot, you can request the fourth side if you think you need it;) Variations include scalloped and ruffled! Changing Pad Cover: Pretty self explanatory:) You will need these, unless you have a newer changing pad like the Keekaroo Peanut or similar. Make sure these will withstand multiple washing and on that note, you will need at least 2-3 and might not want them in white! Minky Blankets: These will come in several sizes, we offer 34"x54" because it's a great size for the crib and as baby grows to a toddler, anything around that size would work. Your pediatrician will probably suggest baby not have a blanket in the crib right away. This blanket is sized to fit the crib, when baby is older (remember baby will be in that crib for 2+years!). In the meantime it's a great snuggle blanket on the rocker or floor blanket to roll on. Our minky blankets features a printed minky front with a sherpa minky backing. Minky is super soft and most people love it, it washes well and doesn't become clumpy. Please note it is polyester, not cotton, in case that's an issue for you. Tip: Minky can be washed and dried, but NEVER iron it! This is Minky, babies love it! So, believe it or not, these are just the main fabric items for the nursery! Taking it further you can always add curtains (remember blackout lining! ), throw pillows, boppy covers, diaper holders, and stretchy car seat covers.